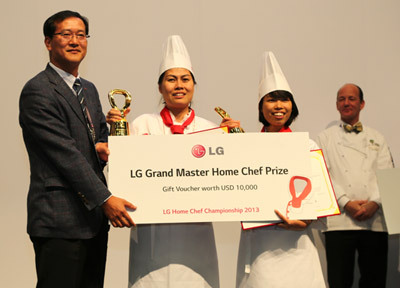 LG Electronics (LG) announced that its sixth annual LG Home Chef Championship (LG-HCC) Global Masters Competition was won by Do ThiDieuThuy and GiapDieufromVietnam. Under the theme of Cook the Dream, Share the Hope, this year's international amateur cooking tournament was held in Cape Town, South Africa and attracted 18 teams from 14 different nations. The Vietnamese team took the coveted Grand Master Home Chef Prize and a USD 10,000worth of voucher for their delicious ‘Baked Quail Filled with ClausenaIndica Leave’ recipe. Meantime, LG Master Home Chef Prize went to Muhammad Iskandar Bin Ishak from Malaysia for his ‘Green Stuffed Chicken’ and LG Home Chef Prize went to Linda Beldjerd and FadilaBeaufilz from France for their ‘Medallion of Monkfish’ included USD 5,000 worth of vouchers respectively. As a key component of this year’s event, LG donated USD 100,000 to support women’s empowerment activities in the Democratic Republic of Congo through the United Nations World Food Programme (WFP), the world’s largest humanitarian agency fighting hunger worldwide. LG has been a partner in WFP’s global work to eradicate hunger since 2009. Meanwhile, the competition contestants providedfree cooking lessons for local non-profit cooking school, Infinity Culinary Training, teaching students how to prepare healthy and tasty dishes using LG’s Lightwave Convection Oven.